Trainer and health advocate Charity Lynette turned her story of losing 100+ pounds into a wellness business. In March, she is launching a new show What’s In Your Basket? on kweliTV and other streaming services. KweliTV is a streaming service that curates independent films and documentaries from film festivals from across the globe as well as web series that celebrate black culture globally. Black Enterprise contributor Brandon Andrews interviewed Curvy Chick Fitness creator Charity Lynette and kweliTV CEO DeShuna Spencer. They talk about the new show and how entrepreneurs can grow their brand on streamed TV. The loss of your mother sparked something in you. You began healthy habits, lost 100 pounds, and became an entrepreneur. How did you transform the emotion from your loss into positive energy? Lynette: To be honest, it took quite a bit of time. After the funeral services, I was in such a bad place. Not only did I lose my mother, but I also lost the job I had along with my boyfriend at the time. After those two things happened, I thought to myself not too much could get worse. I was 310 pounds at the time and that was the final straw. I told myself I will do a hour of cardio a day. I also started a journal and found a church home. Those things allowed me to release that negative energy and feel more productive. Healthy habits are the foundation of your business. How did you convert healthy habits into a business? What was the first step? Lynette: I just honestly started sharing what was working for me. Then spent time trying to come up with programs and plans for different types of people. I was doing practically free workouts to test my programs. I feel that my methods allow you to still live your life. It is about doing what is good for your body. My food intake is real plant-based food. Every once in a while will I eat a cookie? Absolutely, but I encourage my followers to lead a balanced food-and-exercise routine. When did you begin using video to share health tips, and how did that content grow into What’s In Your Basket? Lynette: I was literally approached in almost every store by someone who wanted me to tell them what to get because they weren’t sure what a healthier choice was. I mentioned that to my manager Ernest Jackson of MNS Media Group and he suggested we could help thousands of people if we did this show on a televised platform. Your show What’s In Your Basket? will launch on Roku, NuTV, kweliTV and Apple TV this March. Tell us about the new show. 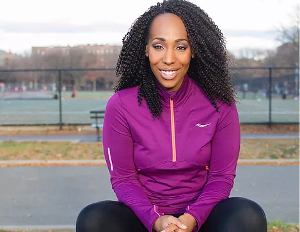 Lynette: The show is going to focus on what is going on in the lives of a few women and show what is keeping them from healthier lifestyle choices. You will be able to see grocery store trips, workouts, and me showing the women and audience how you can implement my advice in your weekly routine. Why was a streaming service the right choice for distribution? We decided to start working on the show about a year ago, but just secured the deal at the end of 2017. We understood that people spend more time watching their phones, laptops, and tablets now than they do the actual television. The great thing about the networks we picked, is they are on the Roku network. The Roku package automatically comes in the smart televisions now. That gives us a great potential audience. With strong marketing, this show will be a hit. It also gives us the freedom to create the content we choose, without much resistance. Why did you think this content was right for kweliTV? Spencer: The producers of the show reached out to us last year about the show and we thought it was a great concept. For me, personally, I think it’s just as important to offer content that’s educational, not just solely entertaining. As a community, there are some of us who have challenges with the choices that we make with our food and it has long-term effects on our health. We currently have a vegan web series as well as an African dance workout series on kweliTV. Our mission is to go beyond movies and be a space in which our subscribers can get advice or tips on how to live and eat better. So yes, What’s In Your Basket? is a perfect fit. For kweliTV, good business sense is staying true to our mission: amplifying the stories of people of African descent around the world that are not stereotypical or monolithic. What is the first step in building a partnership with streaming services to distribute content? Lynette: It really was pretty simple. We reached out to them with our vision for helping the urban community live longer and they loved the trailer and saw the vision. Spencer: First, do your homework to see what platform fits best for your films and intended audience. There are a lot of niche streaming services out here like kweliTV. Everyone wants to be on Netflix or Hulu, which is totally fine. The reality is that if you’re a small director or producer, while Netflix might license your film, they may not market it the same way that a smaller niche streaming platform might. If a big streaming service paid a million dollars for a blockbuster hit and paid $1,500 for your indie film that screened at a few film festivals, they will put their marketing resources in the blockbuster hit while relying on algorithms for people to find the indie film. Most of these services have a submissions process for you to submit your content for review. Another way to connect with streaming platforms is through film festivals. There are a lot of networking events that allow you to connect with those who are in charge of acquiring content for networks and streaming platforms. Now, I’m not saying that you should choose us (or another niche platform) versus a Netflix, just know that there are a lot of different options out there. There’s so much content available for consumers today. How do you distinguish your content in the market? What tips do you have for other entrepreneurs looking to grow their audience? Lynette: We are different because of how we attack our health crisis in the community. I am very active in my community. From free community runs in Brooklyn, to celebrity runs with the community in Manhattan. I’m always trying to be visual and that translates to real support systems. The best thing I can say at this time is stay engaged with your fans and constantly put out content on your online platforms. Spencer: True, there is a lot of content available today. There’s no way we can consume it all. At kweliTV, we are not to be all things to all people. We stay in our niche lane. We know our audience, so we curate content that we know will resonate with our subscribers. We ask our customers what they want to see and we work hard to deliver. While “content is king,” our philosophy at kweliTV is to not create a space in which there’s too much content and overwhelm customers. We have a cap of 500 titles at one time, versus thousands of titles that other platforms might have. In order to grow your audience, you must be authentic. In the media landscape, it is easy to follow the same content formula that has been successful with someone else. Customers are trying to sift through all of the media platforms vying for their attention. If you’re posting the same thing that 10 other outlets are posting without adding your authentic voice that represents your brand, it may be more challenging to build loyalty.